wooden beams. The walls are also white washed. the 19th century original floor tiles and stone sink from the Quinta. the most breathtaking sunsets that the Algarve has to offer. 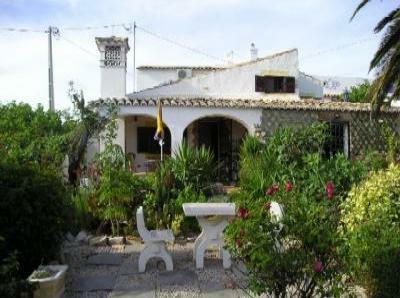 The Casa Do Forno Cottage sleeps a maximum of 2 adults only. tub/jacuzzi. Two of the accommodations also have gas central heating. been furnished to a very high standard with cane and pine furniture. there is no additional charge for heating the pool. with swings, slide, see-saw all amidst an orange grove. Prices from 1st November until 31st March include heating. Oct - £350.00 GBP per week. Prices from 1st October until 30th April include pool heating. cheque, bank transfer or by credit card.